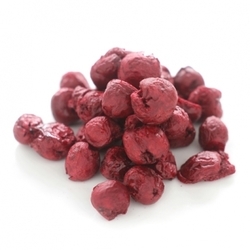 With their vibrant, deep red color and tart but sweet taste, dried cherries make for a flavorful addition to your diet. They provide fuel you need to get through the day - each quarter-cup serving of dried cherries contains 133 calories - and each quarter-cup serving of dried cherries makes up one-fourth to one-third of the daily recommended fruit intake for women and one-quarter for men, according to USDA guidelines. They also provide some essential vitamins and minerals that support your health.Benefits of CopperCherries serve as a good source of copper, an essential mineral. Your body relies on copper to aid collagen production, a process needed to keep your tissues strong. Copper also supports tissue health by protecting you from free radicals - compounds that would otherwise contribute to tissue damage - and by helping your cells produce energy. Each quarter-cup serving of cherries contains 92 micrograms of copper, or 10 percent of your recommended daily intake.